Technology is changing the ways people seek and get knowledge, communicate and work. But Americans still tend to embrace familiarity over newness when it comes to their choices of new products, according to a new analysis of Pew Research Center survey data. Overall, 52% of adults say they “feel more comfortable using familiar brands and products,” and 39% describe themselves as preferring to wait until they hear about others’ experiences before trying something new themselves. Similarly, 39% say they prefer their “tried and trusted” brands. But 35% of Americans say they like the variety of trying new products, and three-in-ten like being able to tell others about their experiences with new technology. 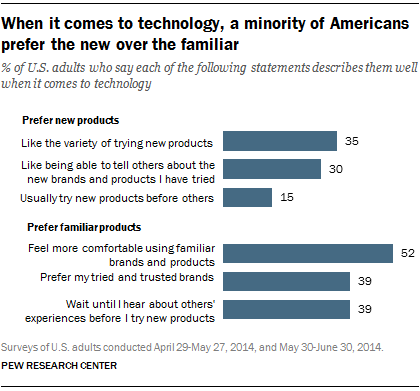 About one-in-six adults (15%) say they usually try technology products before others do. Using people’s answers to these six questions, Pew Research Center created an “early adopter index” that classifies Americans’ preferences for new technology products or familiar ones into three tiers: strong, medium and weak. Some 28% of Americans hold strong preferences for being early adopters and trying new technology products, 45% score at or near the mean of the index, and 26% score low on the index, indicating a stronger preference for familiar technology products. When the six questions are taken individually, the answers suggest a tilt toward the comfort of the familiar, with a committed minority of the more adventurous mixed in. Compared with seniors, younger adults are more inclined to like trying new technology products. These age differences are in keeping with previous Pew Research Center surveys that found younger adults more likely to be interested in science and technology and more likely to own technology products such as smartphones, tablets and computers. And while men and women have similar preferences, index scores suggest that men under age 50 are more likely than either older men or women at any age to prefer new technology products. Technology products have typically come on the market with a high price tag that is out of reach for many consumers. Thus, not surprisingly, adults with family incomes of at least $150,000 annually also tend to express a stronger preference for early technology adoption on this summary index (39% do so) compared with those at middle- and lower-income levels. Those with higher family income are also more likely to be internet users and to own cellphones, tablets and laptop or desktop computers. 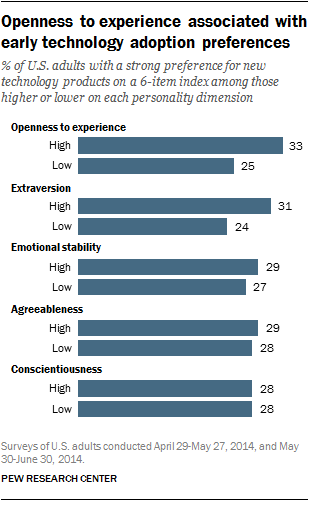 There are also modest associations between two of the Big Five personality dimensions — openness to experience and extraversion — and preferences toward new technology. Americans with higher openness to experience are more likely to prefer early technology adoption; a third of those more open to experience have a high score on the index, compared with a quarter among those who are lower. Extroverts are also more likely than introverts to strongly prefer new technology products on this measure (31% for those who score high on extroversion compared with 24% for those who score low). Do early adopters’ preferences extend to other domains? The survey also asked a similar set of questions about food preferences to test whether people’s preferences for the new are also found in other kinds of choices people make. Using a parallel set of six questions, we classified Americans into those with strong, medium and weak “food adopter” preferences. The results were somewhat different than those about technology. On this index, some 37% of U.S. adults have strong preferences toward being early adopters of food products, 38% are in the middle, and 25% have weak early-adopter preferences, indicating they prefer familiar food products. There are similar patterns in which Americans are most likely to have strong early adopter preferences for food products. For example, as was the case with new technology, younger adults across the age spectrum are more likely than those ages 65 and older to express a preference for trying new food products. 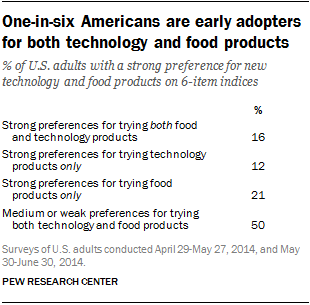 Some 16% of U.S. adults have strong preferences for trying both new food and technology products. 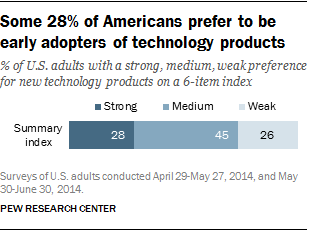 Another 12% of adults have strong early-adopter preferences for technology, but not for food products. Personality also matters. Those with high openness to new experiences are more inclined to have strong preferences for trying both new food and technology products (21% do so among those with higher openness to experience compared with 13% among those with lower openness). See the topline questionnaire and methodology for this survey.